A widespread, but very poorly known species. A lack of recent field observations, a poor understanding of habitat requirements, population size, structure and trends, as well as taxonomic problems prevent the assessment of its risk of extinction. Little Karoo and around the Fish River, Eastern Cape. 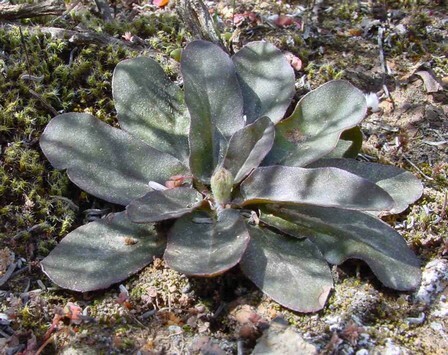 Unknown, possibly restricted to thicket-type vegetation. The threats to this species are not certain as its distribution and habitat requirements are too poorly understood. In the Little Karoo it is threatened mainly by ostrich farming, where ostriches are kept in large numbers in small camps, it leads to complete destruction of the vegetation through trampling (J.H. Vlok pers. comm.). Around the Fish River it is mainly threatened by habitat degradation due to overgrazing, although much of this area is managed as wildlife areas on private game farms. This species is very poorly known. Harvey (1859) cites a few collections scattered over a wide area of the Western and Eastern Cape. There are very few recent collections that are confirmed to be this species. 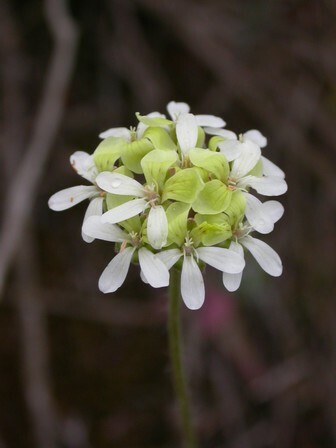 Marais (1994), in her revision of Pelargonium section Hoarea, includes P. ochroleucum in a list of insufficiently known species, but does not provide specific reasons for this decision. Harvey, W.H. 1859. Geraniaceae. In: W.H. Harvey and O.W. Sonder (eds). Flora Capensis I (Ranunculaceae-Connaraceae):254-308. Hodges, Smith and Co., Dublin. Marais, E.M. 1994. Taxonomic studies in Pelargonium, section Hoarea (Geraniaceae). Unpublished Ph.D. Thesis, University of Stellenbosch, Stellenbosch.